Manitoba, and CEO of the Games’ Host Society. Canada Games, plus more community interaction,” notes Hnatiuk. 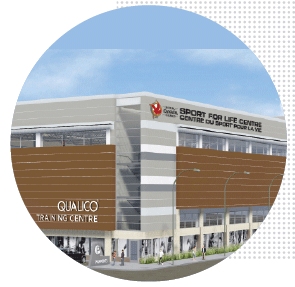 Summer 2015 kicked-off construction of the Qualico Training Centre. The facility will take 18 months to build, and will be attached to the heritage building. There will be permanent seating for 300 in the court area on the first level, with the option to bring in temporary bleachers to seat 1,000 for basketball or volleyball games during the Canada Summer Games and other provincial and national events. Hnatiuk says the amenities the Centre will provide—its sport medicine facility, for example—will help the city and the province bid on future sports events.